I’m always excited at the start of any live show, even more so with a magic or illusion show. I wait in anticipation to be wowed or enthralled from the time the lights darken, a voice-over announcement is made or the curtains start to rise. Suffice to say, the opening of a show is very important in creating the best impression for your show. A good opening gives you a lot of mileage and if you win the audience over from the start, chances are you will have great success with your show. Of course, a lot depends on your performing environment and venue. You will not be able to create the same kind of feel in a brightly-lit open stage in a mall as you would in a state-of-the-art theatre. It is important to design your show opening with specific objectives in mind based on your performing environment. For example, when I perform in corporate or special event settings, my opening is designed to capture the audience’s attention from the start and pull them away from the “distractions” of dinner conversation and the food. However, in a theatre show setting where the audience is already captive, I want to create intrigue, anticipation and an aura of wonder. My objectives are different for both performing environments due to the nature of the show and the technical capabilities of the specific venues. If you perform in a mall, your opening may be designed to stop traffic so that shoppers stop to watch your show. Based on different objectives of a show opening, here are a number of ways to start an illusion show. 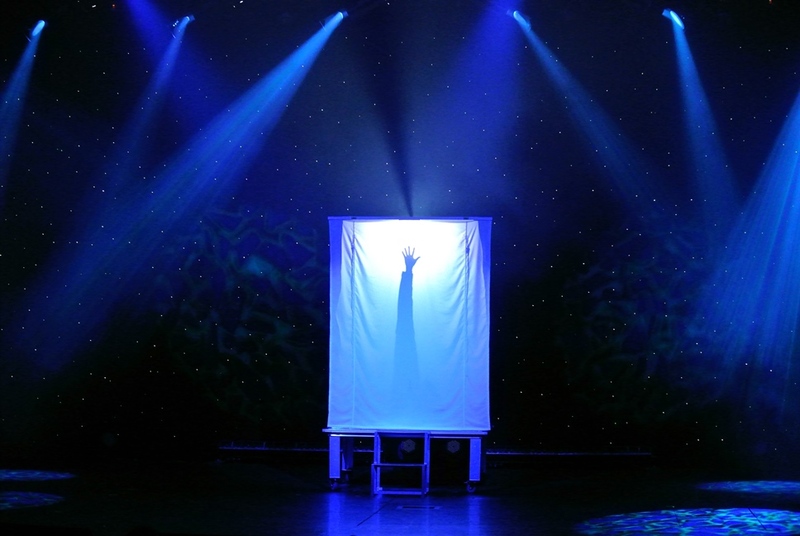 This is one of the most popular ways to start an illusion show. After all, it makes sense (and is almost expected by the audience) for the illusionist to appear in a puff of smoke at the start of the show. Some popular illusions for an illusionist to appear include the Flash Appearance, Smoke Chamber, Flambé, Elevator, Shadow Box and the Fire Dome. Copperfield’s presentation of Jim Steinmeyer’s “Elevator” illusion for his Flying TV special is arguably one of the greatest appearances to start an illusion show. I have seen an argument that considers a magical appearance of the illusionist not ideal as the first illusion of the show unless he/ she is already known to the audience. It is suggested that the appearance is more effective when the audience already knows the performer or has a connection with him/ her. So, an appearance is better to start the second half of a show after an intermission, dance number or variety act. This is likely the second most common way to start an illusion show. The illusionist enters the stage, greets the audience (usually non-verbally) and proceeds to make a pretty girl or girls appear. It achieves the purpose of establishing the presence of the illusionist and presenting a strong illusion effect at the outset of the show. The Crystal Casket, Fire Cage, Blammo Box and Instant Babe are popular illusions as an opening illusion to produce an assistant. I use this approach when performing conditions do not allow me to make myself or an assistant appear. This could be due to a small stage or the lack of side wings to load a person into an illusion. Almost any illusion will work as it really depends on your personal style and preference. A “girl in box” type illusion or Metamorphosis style would work well. Some illusions work better than others. For example, I don’t think an illusion where you enter the stage and then make yourself vanish ten seconds later is ideal. Also, in my opinion, illusions that get to the effect or “action” faster are favoured over longer drawn out sustained effects such as levitations and escapes. I currently typically perform a one-person vertical sawing if I do an opening illusion but also use a light tubes through girl effect as well as Spiker-style illusion from time to time. Many illusionists who first started out with a stage act, may it be a manipulation, general magic or dove act, like to start the show with the act that launched their careers or that they are most well known for. This is especially true if it is an award-winning act. Most also start the show out of necessity because of the loads or pre-sets required for the act. Lance Burton opened with his FISM-winning dove act for years. It was only years later in Monte Carlo when he would magically appear at the top of the show, which then led to the dove act. For new illusionists, from a practical standpoint, an opening stage act that is high impact but is not an illusion is a great benefit as it “saves” from using up an illusion at the start of the show. If you have only two or three illusions, you can still create the visual scale needed for an illusion show. When performance conditions do not allow or if you just do not have the budget to present a strong opening illusion, perhaps the most effective entrance you can do is simply walk out onto stage. The key to a successful walk out is to have confidence in yourself and walk. Choose good music that best personifies your brand and style. If theatrical lighting is available, have the lighting designer design a short but visually appealing sequence to accompany your walk-out. Don’t rush when you walk onto stage and take your time before you speak or perform. Allow the audience to register your presence. Rushing makes you look nervous or unpolished. I suggest watching WWE pro-wrestling ring entrances for inspiration. Many entrances are over the top but will give you an idea of the power of a walk-out entrance to create anticipation, excitement and showcase a character’s persona. Max Maven does a powerful walk-out entrance where he takes his time to allow the audience to “soak in” his presence and “Ming the Merciless-style” image. Then he says “Boo” in a serious deadpan tone. It breaks the tension he builds up with the walk out and gets a great reaction. This is an interesting and effective “appearance” if the venue allows you to do a complete blackout of the lights. The show starts with lights panning across an obviously empty stage. Then the stage goes to a complete blackout. Seconds later, a single spotlight turns on from the top center of the stage and the performer is seen on stage, making a surprise “appearance”. You will need stage marking with luminous glow tape so that you can spot your position in the dark. Mentalist Marc Salem has used this type of entrance effectively in his shows. If you are creative performer and have an off-beat stage personality and style, an unusual appearance might work. Such an illusion/ effect is not a standard appearance per say, it is a surprising introduction of the illusionist with either a magical or special effect. One of the best examples I can think of is Ed Alonzo’s “Creature Crate” Appearance. A scary-looking small creature carrying a crate enters the stage. It reaches the centerstage and struggles with the weight of the crate on its back and the crate collapses onto the creature, only to reveal Ed popping out of the crate at the same time. I personally use the first four ways to open my illusion show depending on the scale of the show and performing environment. Do you have any other effective ways to start an illusion show?